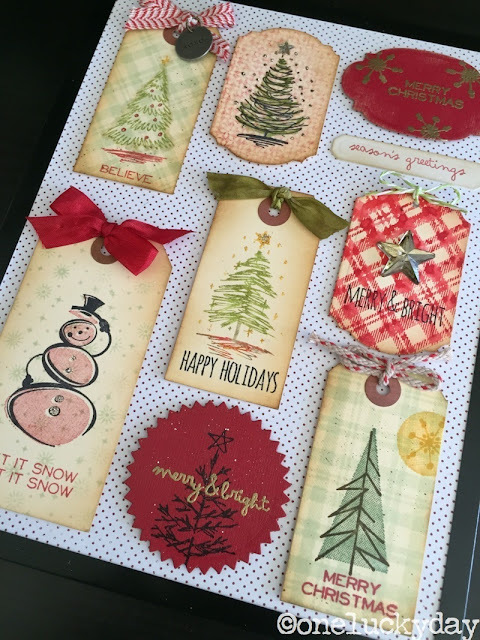 I'm back today with more Stampers Anonymous Christmas cards! Lets start of with one of my favorite sets - Scribbly Christmas. The trees are all about 2 1/2" high....and really, the two sentiment fonts? Can't even express how much I like those! 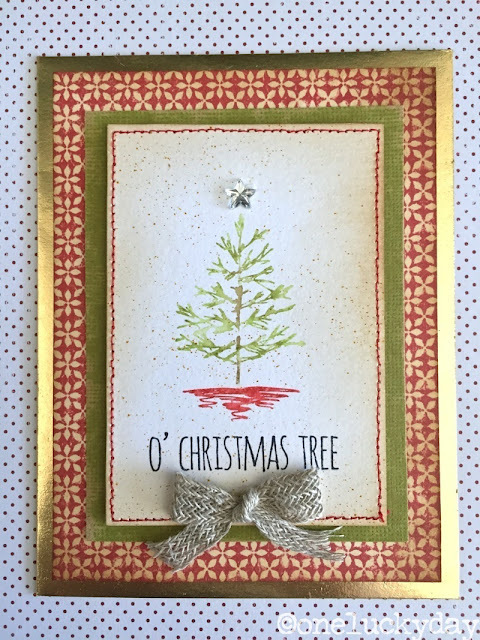 I used Distress Markers to color the tree image then lightly misted it with water before stamping onto the Watercolor cardstock. 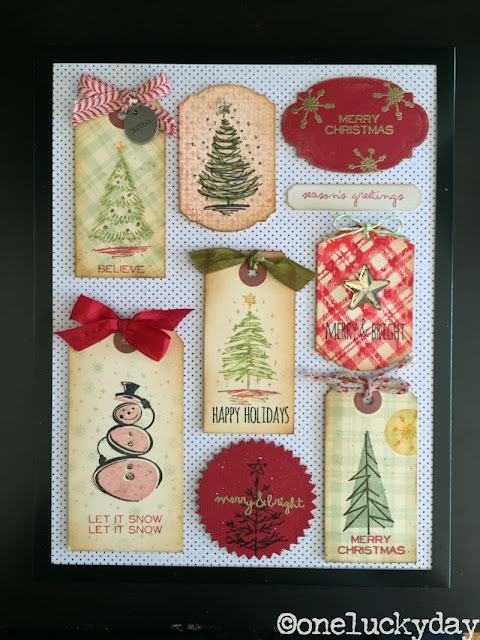 The red stamped background was created using the Plaid & Nordic background stamp set. 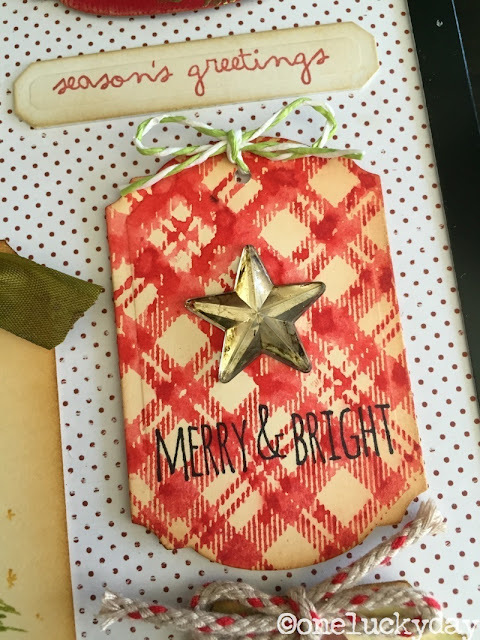 There is a stamped star at the top of the tree image but I did not color it in, instead choosing to add the small mirrored star in it's place. I also used the Distress Marker Spritzer and Fossilized Amber Distress Marker to speckle the background. 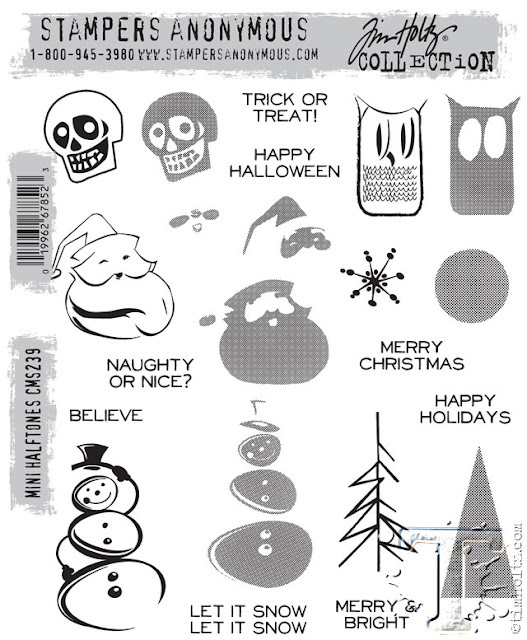 There are two new Snowflake stamps. This one is called Mini Weathered Winter and I like it because the varying sizes of snowflakes. Small tags, large cards? ...it does not matter, there is a snowflake that will work. 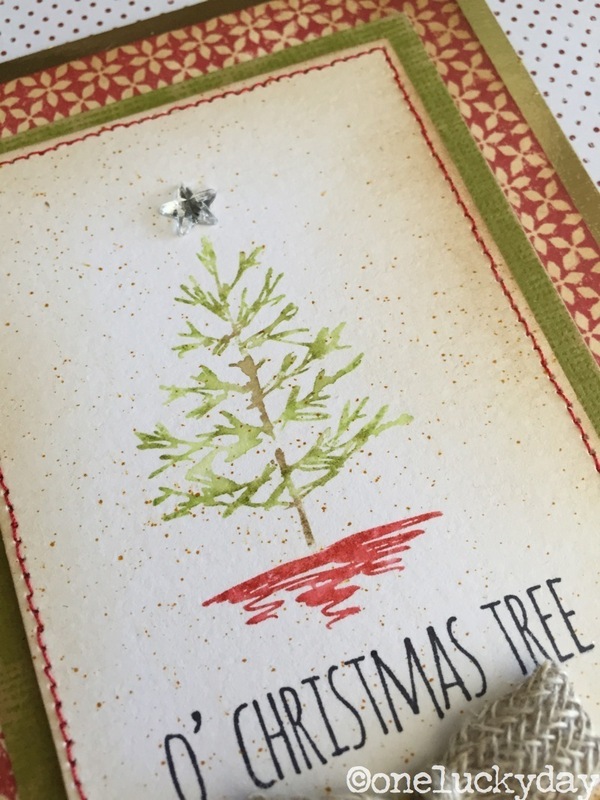 I chose to change up the traditional Christmas colors and use Tumbled Glass ink with silver embossing powder for the snowflakes. I also added a Gumdrop to the sentiment flag. I colored the Gumdrop with Pool Alcohol Ink. Once dry, I lightly pounced over the tops of the little dots with Silver Mixative Alcohol Ink for a bit of metallic shine. 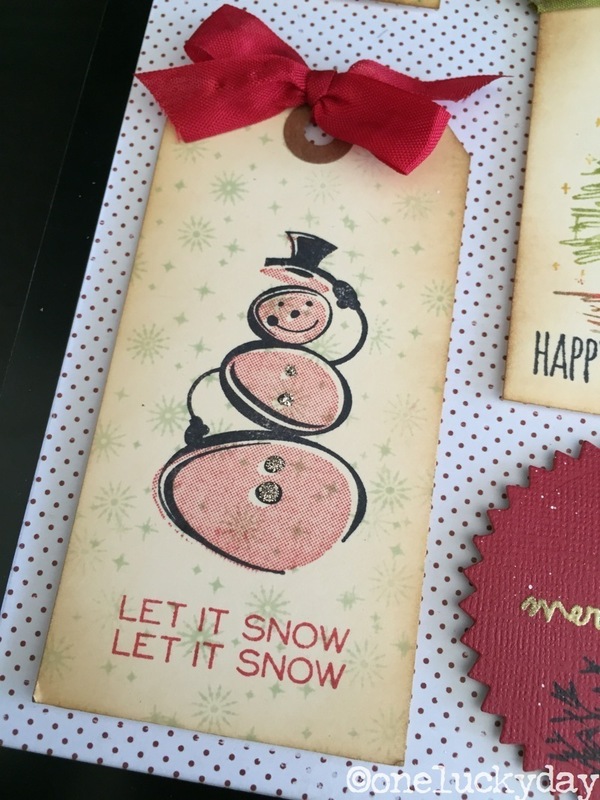 The Ranger Silver Embossing powder worked great on the snowflakes! I also made tags using the Scribbly Christmas set and the Mini Halftone set. I used different manila size tags and made other shapes like the circle and oval using the Sizzix Thinlits die - Labels. Festive Berries Distress Ink + water makes for a faded vintage background (Nordic stamp). Tree stamped in Archival Jet Black and colored with Distress Markers and detailer water brush. My very favorite tag...that plaid background on the bias again. 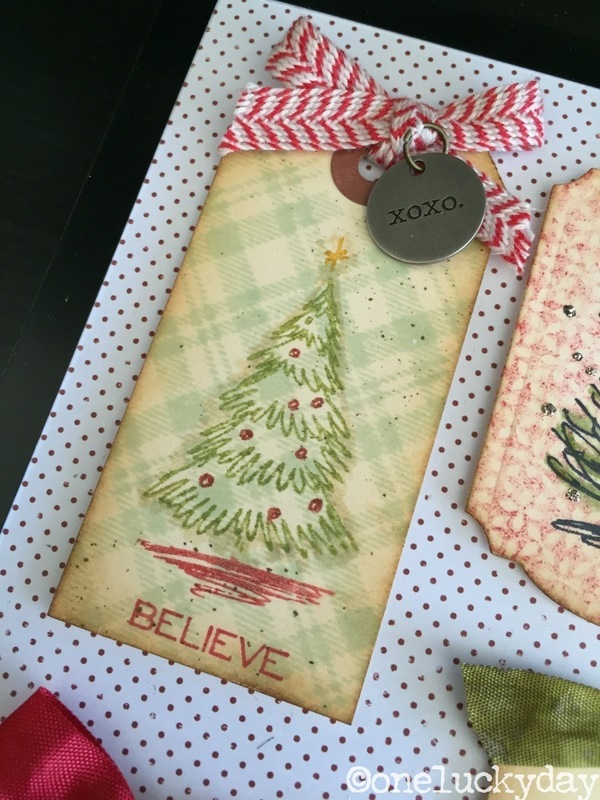 This time Festive Berries Distress Ink on the stamp + water misted over the top to get a watercolor look. The large Mirrored Star colored with Mushroom Alcohol Ink is the center piece! Both tags cut from the Labels Thinlits set. Oval tag - images from the Mini Half Tone stamp set embossed with Gold. 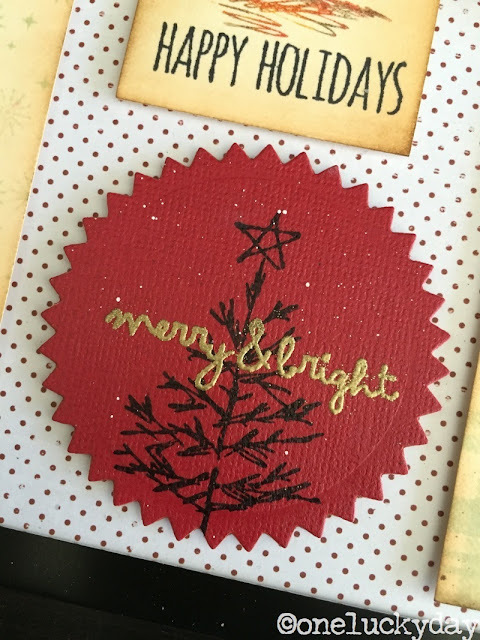 Scribbly Christmas - tree stamped in Jet Black Archival + words in gold embossing powder + flicked with Picket Fence Distress Paint to create the snow background. Added Crinkle Ribbon, Paper String, Red and White Trimmings and Typed Tokens to finish. Well I hope you liked the stamp sets - so much fun getting to use them! 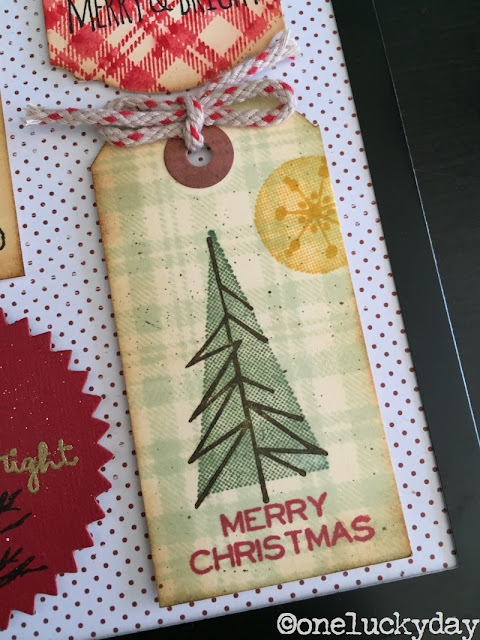 Even though I know July is not the time I want to be thinking about Christmas, it is the time I start getting ideas for cards, tags, gift wrapping. Otherwise, December sneaks up on me and I'm not prepared! It has happened more than once around here! 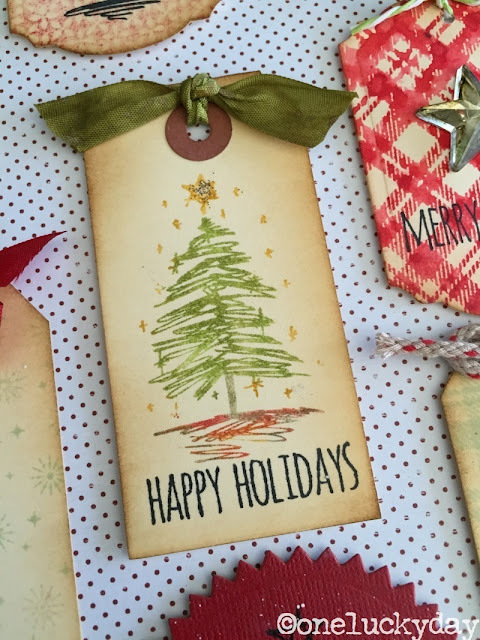 How fun are these cards and tags! Love seeing samples made with the new stamps. Kind of like test driving them before they are available. I'm with you Paula- pre planning for holiday crafts is a good idea. December has a way of coming at light speed. thanks Sharon! Every year I say I'm going to make Christmas cards and I never do because I get too busy. thanks Anja! I can't wait to see what you do with them - your work is always inspirational! thanks for stopping by Patty! Great projects with these fun new stamps - love the tag designs! I love that plaid stamp - more than I even imagined I would. I guess I am always drawn to stamps that can be changed up over and over. Oh what fun! The plaid background is a must have. TFS Paula! You are right Deb - it is a must have background!! So many applications! I really like what you've done with all of these great, new stamps! The snowflakes and little trees are especially fun. thanks Renee M!! 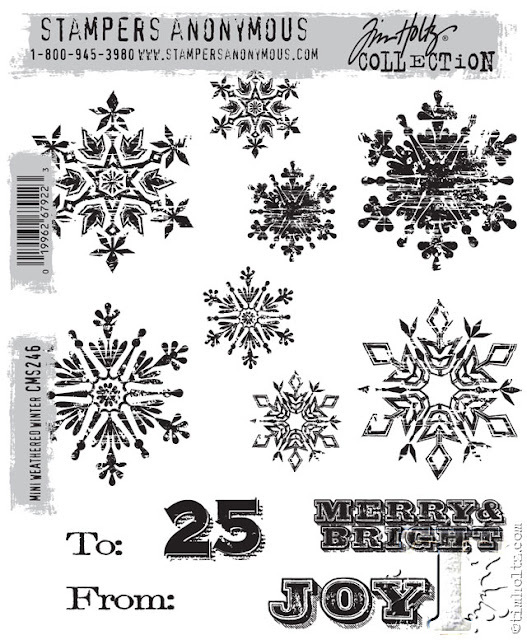 The snowflakes are great with or without embossing powder. Love that they are a little bit distressed too. A Christmas Kit this year??? Put me on the list if you do! I love all your creations there are beautiful...sigh...now I need those stamps! Did I really see no Iced Spruce in the bunch?! You make the bestest tags, Paula! I just love them. Wow. Guess I'm going to have to start thinking about Christmas! Really like what you've done. 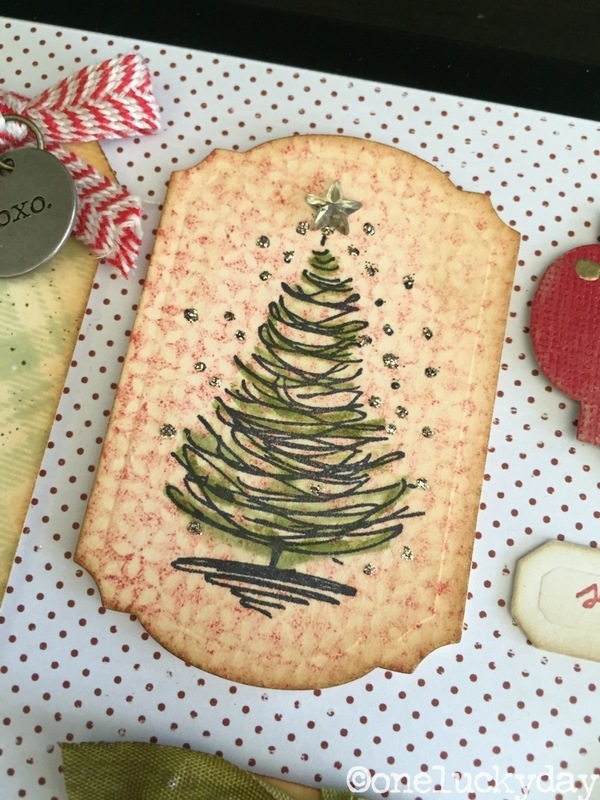 Lovely cards, tags, and all delicious Paula!! Love the stamps. Wish you a nice weekend, big hugs, Caty. Love, love, love the Scribbly Christmas trees. 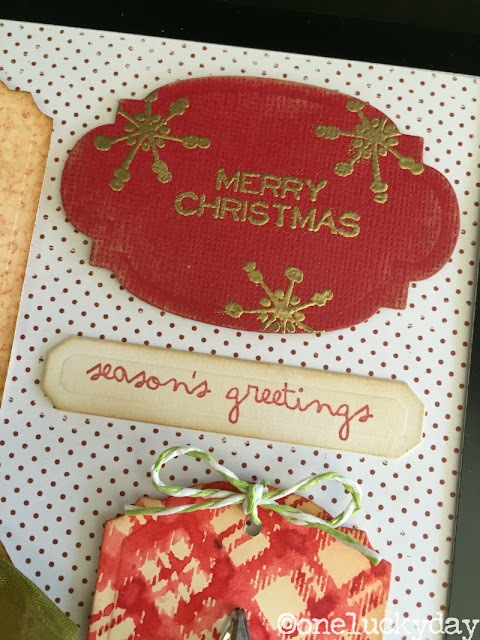 Your tags and cards are wonderful. I'm thinking I'll be making some tags on my gifts this Christmas. Thanks for sharing Paula. I just love these adorable trees! Oh that plaid stamp! I will make the tags even if I don't have enough gifts to put them on. Thank you Paula. Don't know how you do it all. The new releases are great and the framed piece made me reminisce about an infamous advent calendar assemblage of christmas tags. The plaids and polka dots really reinforce the mid-century vibe that his one has. Wonderful Paula, love the cards (and there's the wonderful plaid again) and the tags! So great, each one is a little gift all by itself. Thanks for sharing your fabulous ideas. These are fantastic,Paula!!! It is never too early to start thinking about Christmas! It's so hard for me to pick a favorite. 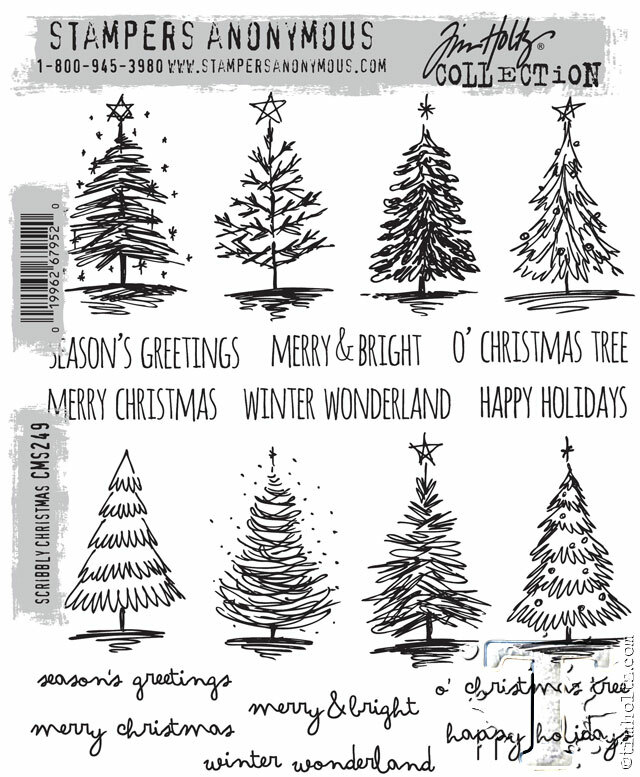 I'm loving the plaid, the scribbly trees are great, those snowflakes are awesome! Hmmmm, it's just too hard…one of everything pretty please! Don't know why I'm not getting your feed...ugh. LOVE all of these. The mini tags are so darn cute!!! Oh no, and there was me thinking I didn't "need" those little trees - fab inspiration! I see from Anita's comment that I'm not the only one not getting your feed - boo hoo!